This present case illustrates concepts and techniques of using the operating microscope to visualize and repair the perforation nonsurgically. A 35-year-old female patient reported to the Department of Conservative Dentistry and Endodontics, Dr. R. Ahmed Dental College and Hospital, Kolkata, with pain in tooth No 11. 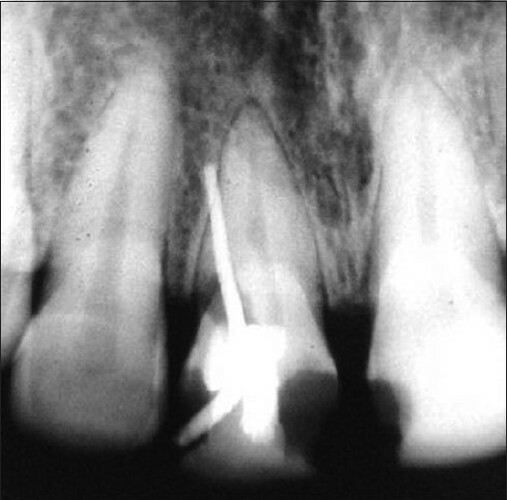 She gave a history of root canal treatment (RCT) having been attempted elsewhere on that tooth, about one month prior. Clinical examination revealed that access preparation had been attempted in the grossly carious maxillary right central incisor. 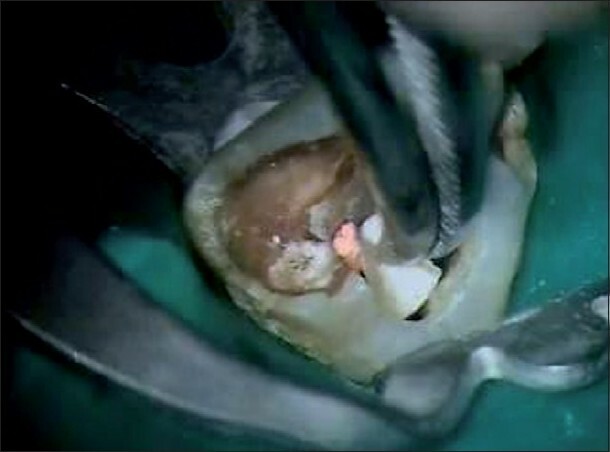 Under rubber dam isolation, the access opening was carefully examined under a Dental Operating Microscope (FS - 1-11; MOELLER - WEDDEL INTERNATIONAL, Germany) (16X Magnification). Distolateral midroot perforation with ledge formation was clearly visualized under the microscope [Figure 1]. 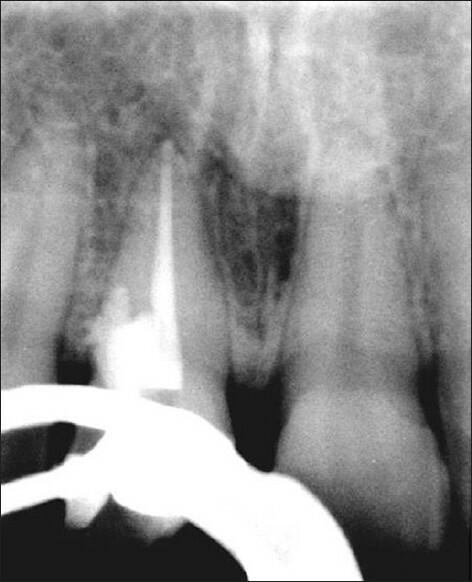 An intraoral periapical radiograph was taken with a #60 size gutta percha (GP) point placed in the perforation, which aided in further localizing the site of the perforation, and it was confirmed that the defect was subcrestal [Figure 2]. A slight periodontal ligament (PDL) widening was seen. 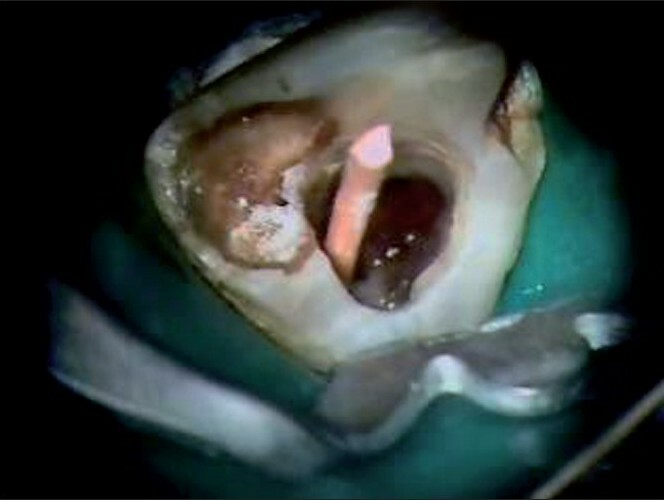 The decision to nonsurgically manage the perforation using Mineral Trioxide Aggregate, under a Dental Operating Microscope, was taken with the patient's consent. The lateral walls of the perforation were refined and cleaned with light brushing strokes using an Endo 4 ultrasonic tip (Dentsply Tulsa Dental, Tulsa, Oklahoma). Hemostasis was achieved. A #60 size gutta percha point was used to establish the length from the incisal reference point up to the perforation site inside the root canal. Healiguide (ENCOLL, Fremont, CA, USA), an absorbable collagen material was chosen to provide complete hemostasis and a controlled barrier, to pack the restorative material against it. Working length was established and a #40 size GP point was placed in the canal [Figure 3]. Pieces of healiguide were appropriately cut and carried out into the access cavity [Figure 4]. These were progressively placed into the chamber with an appropriate plugger and firmly pressed through the perforation defect. A solid barrier was established [Figure 5]. 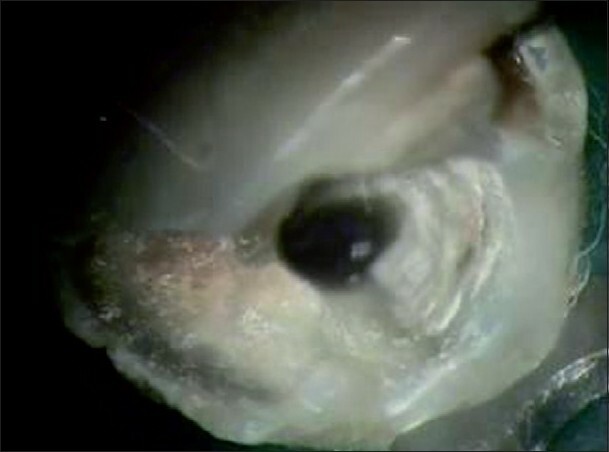 The access cavity and perforation defect were flushed thoroughly with normal saline and dried. Mineral trioxide aggregate (MTA - ANGELUS; Peterborough, UK) was mixed and carried to the perforation site with the help of a carrier and packed with an appropriately fitted plugger. Repair of the perforation was carried out by progressive placement and packing of small increments of the Mineral Trioxide Aggregate. The gutta percha point was removed and moist cotton pellets were placed over the Mineral Trioxide Aggregate, and closed with noneugenol temporary restoration (Cavit, 3MESPE). The Mineral Trioxide Aggregate was allowed to set for approximately four hours and the patient was recalled after four hours. The canal was opened and it was found that the well-adapted, hard Mineral Trioxide Aggregate had sealed the perforation site and ledge area [Figure 6]. Biomechanical preparation was carried out using the step back method. Apical preparation was performed up to size #60 and obturation was done by lateral condensation of the gutta percha [Figure 7]. After one month the patient was recalled and was found to be asymptomatic. The glass fiber post was cemented by dual cure resin cement (Calibra - DENTSPLY). The crown was restored by a light cure composite resin [Figure 8]. A one-year recall examination, clinically demonstrated an asymptomatic tooth, with normal attachment and architecture of the soft tissues. 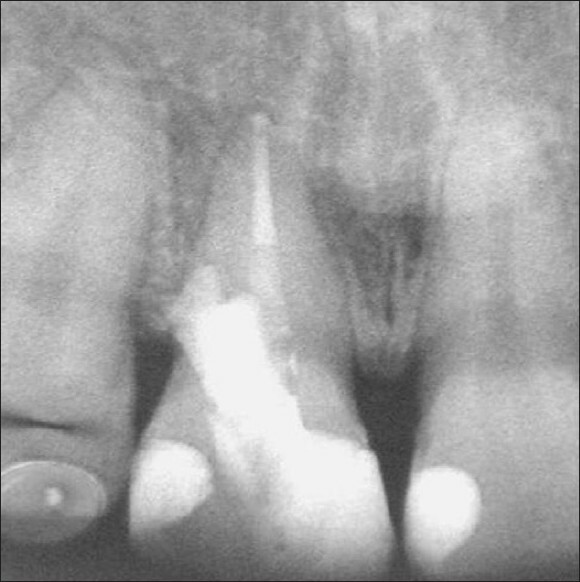 A radiographic analysis at this recall evaluation revealed no development of a periapical lesion and no further widening of the PDL [Figure 9]. The patient was advised to put in a crown, but she did not report back, as she had migrated. The increased magnification and dual light source of the microscope is invaluable to diagnose and locate accurately the exact perforation site. , Incremental placement of restorative material like the Mineral Trioxide Aggregate over the perforation site can be carried out successfully and precisely under a microscope. 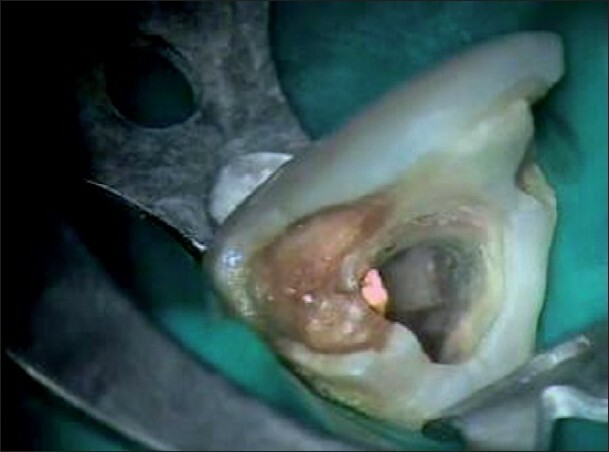 As the perforation was in the middle third of the root and sufficient access was available through the pulp chamber, the perforation was repaired nonsurgically. The perforation site was cleaned and refined by Endo 4 ultrasonic tip (Dentsply Tulsa Dental, Tulsa, Oklahoma) to ensure an environment free of microbial contamination and necrotic tissue. 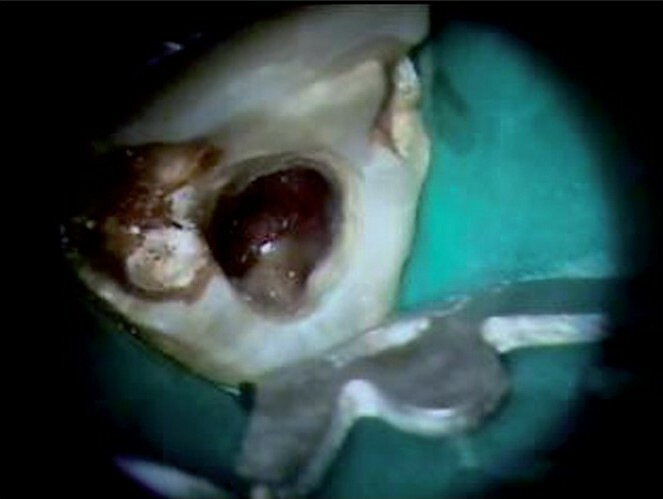 The internal matrix concept, in conjunction with the microscope, is an efficient and effective technique for treating accessible perforations nonsurgically. In the present case we placed a sterile, resorbable, and biocompatible collagen material Healiguide into the perforation site, to control hemostasis and prevent overfills, and it acted as an internal matrix. The location of the perforation is an important factor for its successful repair. More apical the perforation, the better the prognosis. In the present case the perforation was in the midroot, but yet prognosis was favorable even after one year. Training, practice, and technology allow clinicians to expand their abilities greatly in endodontic treatment. Correction of procedural errors can now be performed with a higher degree of clinical confidence by using a Dental Operating Microscope. The use of the microscope and its inherent precision is closing the gap between theoretical possibility and clinical reality. 1. DCNA, Microscopes in Endodontics 1997;41:3. 2. Ingle, Bakland, Baumgartner: Ingle's Endodontics; 6th ed. 3. Stephen C, Kenneth M. Hargreaves: Pathways of the Pulp. 9th ed. 4. Roda RS. Root perforation repair: Surgical and nonsurgical management. Pract Proced Aesthet Dent 2001;13:467-72. 5. Birte Nikolaisen Myrvang: Case Book; University of OSLO Dental Faculty; 2006. 6. Ghoddusi J, Sanaan A, Shahrami F. Clinical and radiographic evaluation of root perforation repair using MTA. N Y State Dent J 2007;73:46-9. 7. Aziz S, Ali AK, Moeen F. Two successful cases of root perforation repair using mineral trioxide aggregate. Pak Oral Dent J 2008;28:103-6. 8. Silveira CM, Sánchez-Ayala A, Lagravère MO, Pilatti GL, Gomes OM. 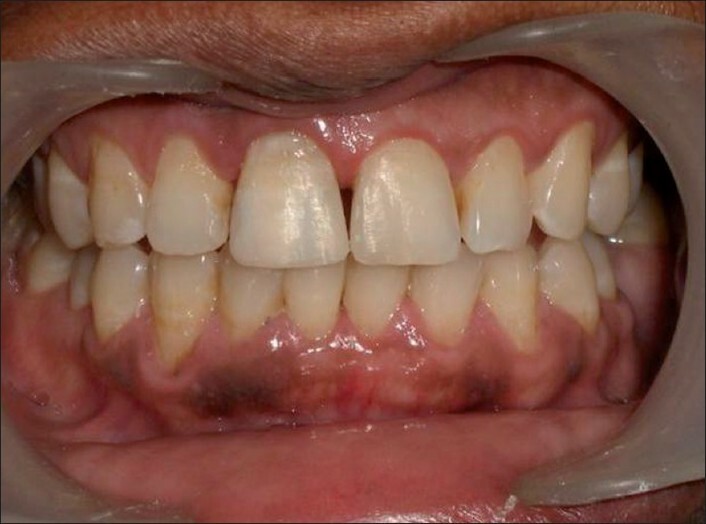 Repair of furcal perforation with mineral trioxide aggregate: long-term follow-up of 2 cases. J Can Dent Assoc 2008;74:729-33. 9. Schwartz RS, Mauger M, Clement DJ, Walker WA 3rd. Mineral trioxide aggregate: A new material for endodontics. J Am Dent Assoc 1999;130:967-75. 10. Castellucci A. Magnification in endodontics: The use of the operating microscope. Pract Proced Aesthet Dent 2003;15:377-84. 11. Vajrabhaya LO, Korsuwannawong S, Jantarat J, Korre S. Biocompatibility of furcal perforation repair material using cell culture technique: Ketac Molar versus ProRoot MTA. Oral Surg Oral Med Oral Pathol Oral Radiol Endod 2006;102:48-50. 12. Koulaouzidou EA, Economides N, Beltes P, Geromichalos G, Papazisis K. In vitro evaluation of the cytotoxicity of ProRoot MTA and MTA Angelus. J Oral Sci 2008;50:397-402. 13. Juárez Broon N, Bramante CM, de Assis GF, Bortoluzzi EA, Bernardineli N, de Moraes IG, et al. Healing of root perforations treated with Mineral Trioxide Aggregate (MTA) and Portland cement. J Appl Oral Sci 2006;14:305-11. 14. Moghaddame-Jafari S, Mantellini MG, Botero TM, McDonald NJ, Nör JE. In vitro Effect of ProRoot MTA on pulp cell apoptosis and proliferation. J Endod 2005;31:389-91. 15. Qatharni HA. In vitro Effect of root perforation repair materials on morphology and attachment behavior of human PDL fibroblasts. Saudt Dent J 2004;16:113-7.